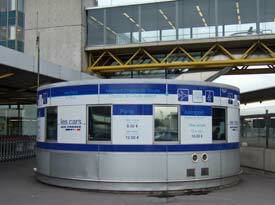 ABOVE: The outdoor ticket office for Les Cars Air France at Orly-Sud terminal. INSET BELOW: An Orly Airport control tower, and the RATP's articulated Orlybus. Line 1 of Le Bus Direct Paris Aéroport (formerly Cars Air France) connects the Sud and Ouest terminals with the Gare Montparnasse, Eiffel Tower, Trocadéro, and Étoile Champs Élysées every 20 to 30 minutes from around 5 a.m. until late at night. Minimum travel time is 20 to 50 minutes, depending on your destination. Line 3 runs between Orly and CDG, with departures every 20 to 30 minutes and an average travel time of 7o to 80 minutes. Buses are air-conditioned and have luggage compartments where the driver will stow your bags. For current fares and timetables, visit Le Bus Direct. A shuttle bus runs connects the Sud and Ouest terminals with the Pont de Rungis-Aéroport d'Orly station of RER Line C, where a commuter train will take you along the Left Bank to the Gare d'Austerlitz, St-Michel/Nôtre-Dame, the Invalides, and the Eiffel Tower. For up-to-date information on all public bus and train services from Orly, see this page at the RATP Web site and scroll down to the Orly section. The 1- to 5-zone Paris Visite card is good on all of the services above, except for Les Cars Air France. (The cheapest Paris Visite pass, which covers only Zones 1 to 3, does not cover airport transportation.) The Navigo pass ("all zones") is also valid.